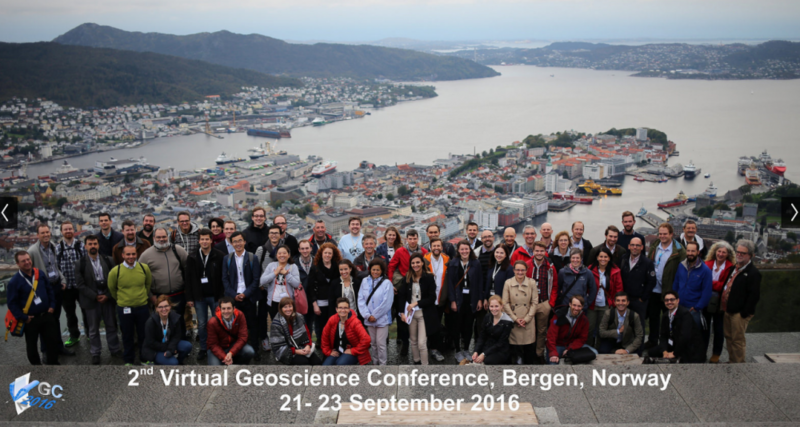 The second Virtual Geoscience Conference was held in September in Bergen (Norway). Organized by CIPR and the University of Begren, over 100 persons took part to this multidisciplinary conference which aims at understanding the recent trends and convergences of research in geomatics (spatial science), 3D visualisation, computer graphics, as well as virtual and augmented reality into geosciences applications. A large panel of scientist from geohazards, geology, geomorphology, reservoir engineering, surveying, 3D computing as well as infrastructure and natural resources were present. Exfoliation sheets detection with terrestrial laser scanning and thermal imaging (Yosemite Valley, California, USA). A Guerin, M-H Derron, M Jaboyedoff, A Abellán, O Dubas, BD Collins & GM. Stock. Development of a TLS real-time monitoring system for landslides. RA Kromer, A Abellan, J Hutchinson, M Lato, M-A Chanut & M Jaboyedoff. Point cloud time series for monitoring landslide processes: Displacement field analysis using image correlation and optical flow algorithms. P Bornemann, A Guérin, J-P Malet, C Vulliez, J Travelletti, A Puissant, M-H Derron, M Jaboyedoff, M-A Chanut & L Dubois. Rockfall monitoring of a poorly consolidated marly sandstone cliff by TLS and IR thermography. C Lefeuvre, A Guérin, D Carrea, M-H Derron & M Jaboyedoff. Virtual analogues of Ypresian carbonated fractured reservoir at Ousselat Cliff (Central Tunisia) using terrestrial laser scanning and GigaPan techniques. R Mastouri, A Guerin, M Jaboyedoff, S Bouaziz, M-H Derron, M Lazzez & A Boulares. The VCG cycle (initially Vertical Geology Conference) was initiated in Lausanne in 2014. The third conference will take place in Kingston Canada.